Augsburg - Vedad Ibisevic kept VfB Stuttgart’s UEFA Europa League hopes alive on Thursday and the Bosnian will again be the man the Swabians will be pinning their hopes on in Sunday's bottom-of-the-table clash with FC Augsburg (kick-off 17:30 CEST). A late goal at HNK Rijeka saw Stuttgart come away from Croatia with a 2-1 defeat, but an away goal which could prove crucial in the final reckoning next Thursday. The 29-year-old has spearheaded Stuttgart’s attack in the Bundesliga too, scoring one of only two goals the Swabians have scored so far this season, while his goals in the DFB Cup earned Bruno Labbadia’s men a second-round clash with SC Freiburg next month. The importance of Ibisevic to Stuttgart could hardly be emphasised enough, which is why all eyes will be on him in Sunday’s basement battle, including those of Augsburg coach Markus Weinzierl. “They have a brutally strong attack,” said Weinzierl, whose own side are the only Bundesliga outfit yet to find the back of the net this term, and that in spite of sending in 31 shots. “We know we’ve got to improve and work on becoming more effective, but I can promise we will give 1000 per cent,” said the Augsburg coach, who is not concerned about the form of his own striker Sascha Mölders, who has now gone 435 minutes without scoring. “It’s absolutely stupid to count the minutes,” said Weinzierl, who knows all too well that Mölders has a special penchant for facing Stuttgart - his only goal in the last six months game against the Swabians. “His goal will come,” said Weinzierl, shrugging off his striker’s and his team’s drought. 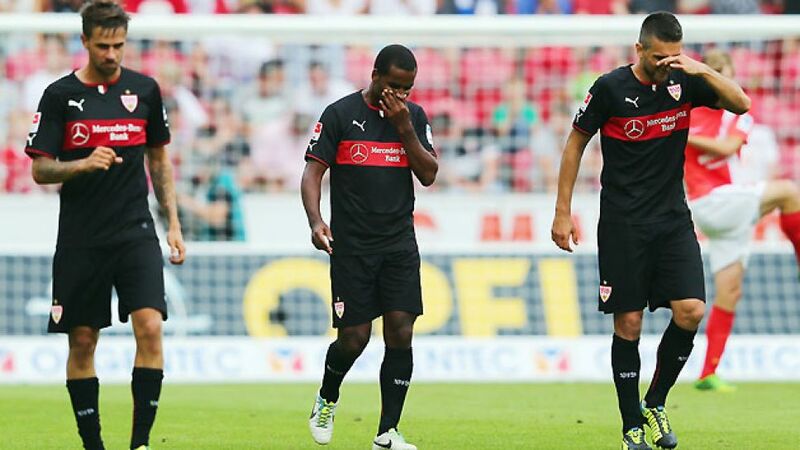 The Bavarians were in the same situation a year ago, as were Stuttgart, yet both pulled away from danger in the end. “We want goals, we want a clean sheet and we want to reward ourselves for our efforts,” was the clear, unmistakable objective formulated by the Augsburg boss. Stuttgart’s sporting director Fredi Bobic was even franker about his expectations at the SGL Arena. “It’s quite clear, we’ve got to get the points,” he stated. “To do that, you’ve got to score goals, or else you can’t win any games and you won’t gain any points either. It’s up to us to turn things back in the right direction,” he explained. Bidding to prevent them from doing just that is a player of their own, Raphael Holzhauser, who is at Augsburg on a season-long loan. He is looking forward to meeting his employers, who he insists are favourites to win. “If you just look at the aims of both clubs, then of course VfB are favourites,” he said on Stuttgart’s website. “Stuttgart want to go higher so our aims are different, but we share the need for three points. I think both sides are under pressure."